Kigoma – A successful Hat-Trick Initiative creating locally owned, sustainable community programs. April 27th, 2011. From Colin, Jessica and Nathan in Kigoma. Greetings from Kigoma! We are extremely happy and proud to report that yesterday we put the finishing touches on the SportCourt surface at Katubuka Primary School. 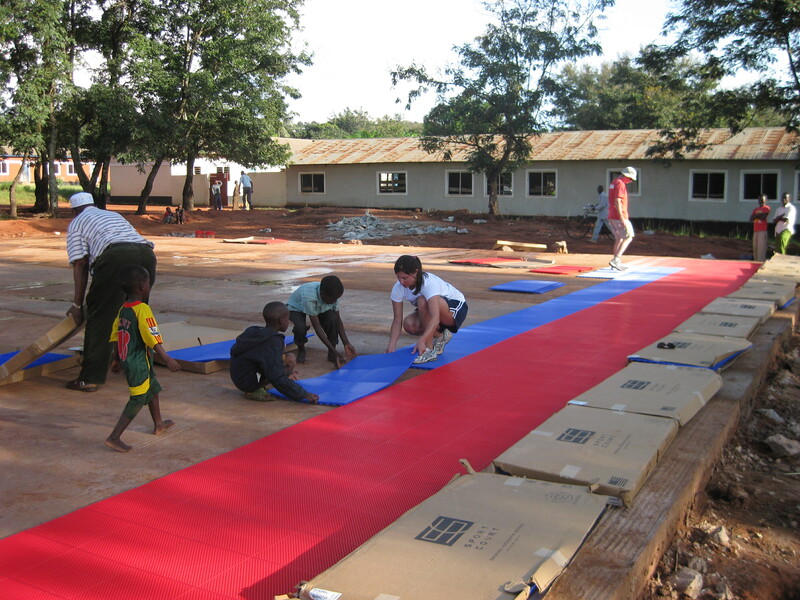 We started laying down the tiles bright and early yesterday morning and, along with some help from the local children who will use the grounds, we had everything in place by mid-morning. We then spent the rest of the day painting the game lines for basketball, netball, volleyball, and soccer. By the late afternoon, a crowd had gathered around the outer edge of the field as word and excitement spread around town; our challenge for the rest of the day (and throughout today as well) was keeping the eager kids/adults at bay as the paint on the lines dried. Later this afternoon, we’ll hold the inaugural training session on the SportCourt surface with a girls team from Katubuka. We’ve had a few opportunities to work with this team in the past week, and they’re a blast – enthusiastic, eager to learn, happy, engaged, brilliant, and talented. Today will be a great opportunity for them to be the first students on the pitch and for us to have a “soft launch” before the official opening ceremony that will take place on Friday in front of local media, government officials, and townspeople of Kigoma. 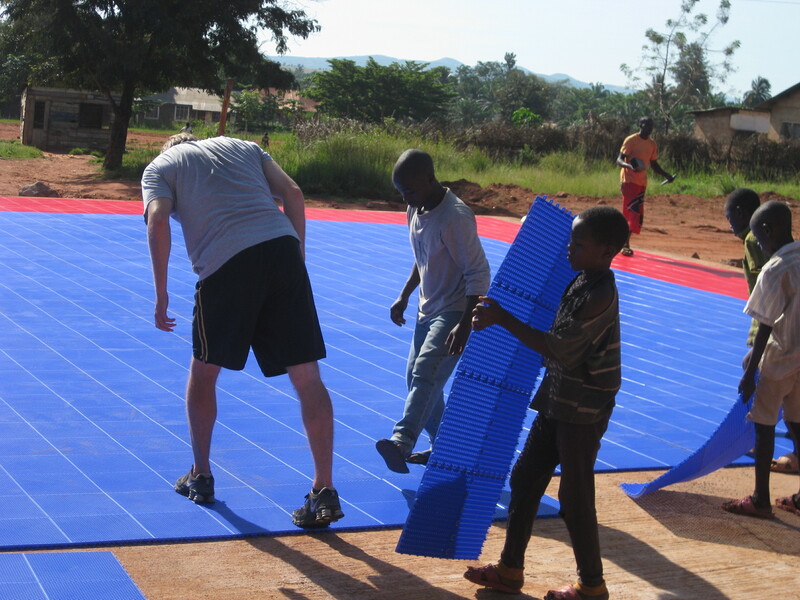 Our primary goal here in Kigoma was to help with the conclusion of the SportCourt project (a 12-month effort from CAC/BeyondSport/SportCourt), and we couldn’t be happier with the way it has come together. This facility will provide a first-class playing surface for almost 5,000 kids around the area, and with the proper stewardship, it will last for 15 years. Thanks to the support of our partners, coaches, students, and volunteers, we’ve helped to create a sustainable community center that will be a point of pride for the people of Kigoma for years to come. The Opening Ceremony will be on Friday. “There are a lot of people to thank for this amazing Hat-Trick Initiative. 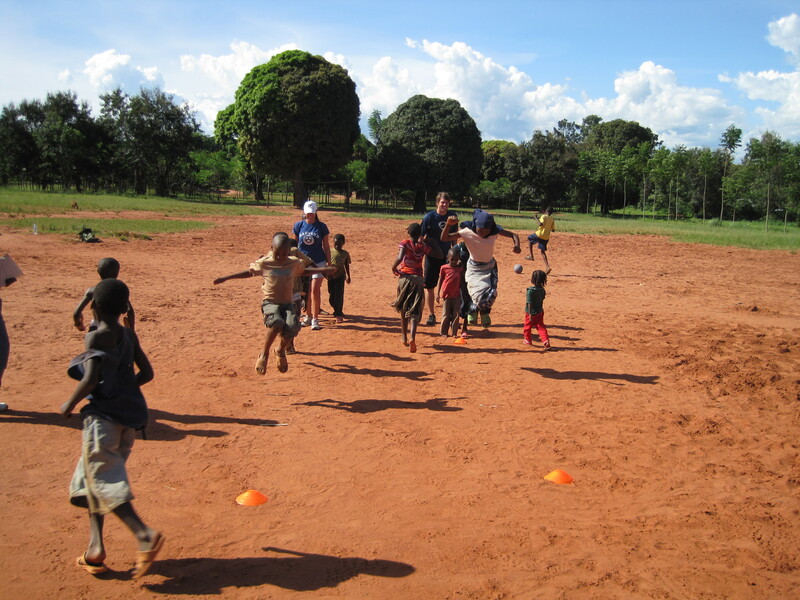 Melissa was the first coach in Kigoma in 2008, followed by Christian, Devon, Brian and Tracy in 2009 and 2010. And this year Colin, Jessica, Nathan and Ryan put the final pieces together. Nicholaus Achimpota, the Sports Director has developed the first ever sports program and Beyond Sport and Sport Court have worked to provide the new facilty that secures sustainability. Special thanks go out to Christian from Coaches across Continents and Rowena from Beyond Sport for their tireless work on the Sport Court project over the past 8 months. 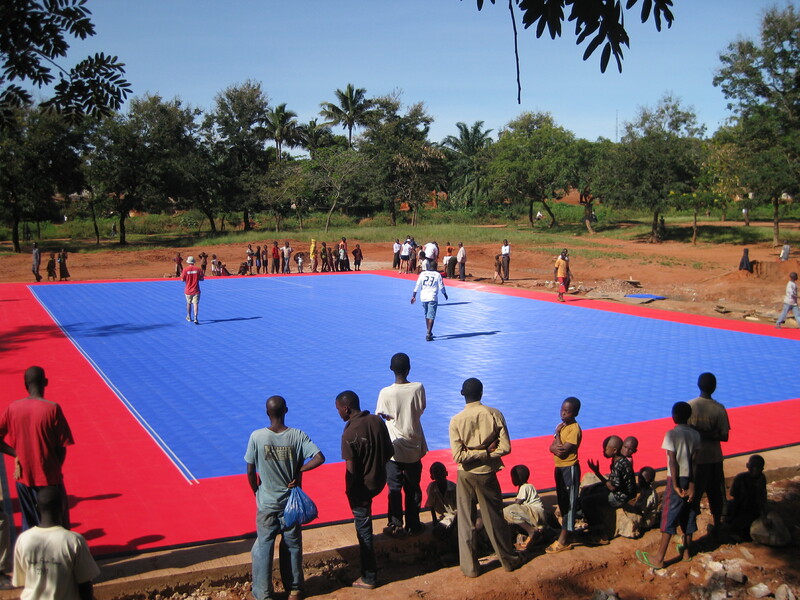 And we are incredibly grateful to Sport Court for the Beyond Sport/Sport Court Award that has provided this $50,000 facility to the Kigoma community.” Nick Gates, Founder Coaches across Continents. Fantastic! That court will last for decades, and generations of kids will have the opportunity to play and train on a safe sports surface. The court looks beautiful! I’m already looking forward to seeing photos of the completed court and the opening ceremony! Congratulations to Coaches Across Continents and Beyond Sport for this amazing project! Well done everyone connected to this project. The Sport Court looks fantastic.